(from Sports Business Journal, October 28-November 3, 2013) LifeVantage has officially signed a deal to be MLS’s Real Salt Lake’s new jersey sponsor. LifeVantage will be replacing XanGo which has been Real Salt Lake’s sponsor since 2005. This will be LifeVantage’s first sport-marketing expenditure. The new LifeVantage jerseys will make their debut in the 2014 season sporting a sharp new design by Adidas. LifeVantage President and CEO, Doug Robinson, said he had been curious about Real Salt Lake’s jersey deal for more than a year. He was pleased that this deal was completed in just over month and was officially finalized on October 16 at LifeVantage’s headquarters. The presidents of both organizations met on September 13 for their first meeting. They instantly bonded over the fact that they would rather be eating at Johanna’s, a local dive, then at the upscale restaurant they were at. From there the business conversation about the jersey deal flowed. Ten days later the companies held a formal presentation, and just four days later the contact was finalized. LifeVantage wanted to get into the niche that the Real Salt Lake fans were from. They knew this would help in expanding their already huge company. 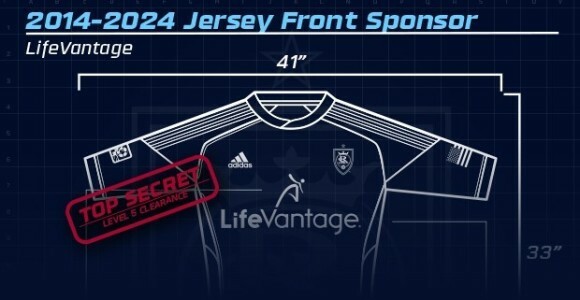 Two days after the contract was signed, LifeVantage already had the new jersey on display. The jersey made its debut at a quarterly meeting in St. Louis in front of 5,000 fans. Bill Manning, Real Salt Lake President, was astounded at how fast this deal with LifeVantage was made. They had beat the record.